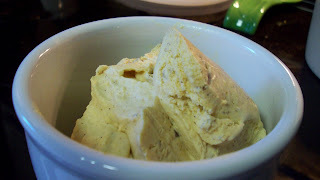 Todd and I had some delicious pumpkin ice cream at the apple orchard last weekend and I wanted to try making some. I found a recipe at Williams-Sonoma so I thought I would try it out. The original recipe can be found here. While cream mixture is heating, combine egg yolks, spices and remaining cream and brown sugar. Whisk until smooth. Remove cream mixture from heat and gradually whisk in about 1/2 cup of the hot cream to temper the egg mixture. Pour egg mixture back into pan. Cook, stirring constantly over medium heat, until thickened, about 4-6 minutes. Do not allow the custard to boil. Pour the custard mixture back into a bowl, placing the bowl into a larger bowl filled with ice water. Allow the mixture to cool and whisk in the pumpkin mixture. Cover and refrigerate the custard mixture at least 3 hours (I refrigerated mine overnight). Transfer custard mixture to an ice cream mixture and pour in half and half and freeze according to mixer instructions. During the last minute of freezing add 1 tablespoon of bourbon and 1/2 cup pecans. Freeze at least 3 hours before serving.